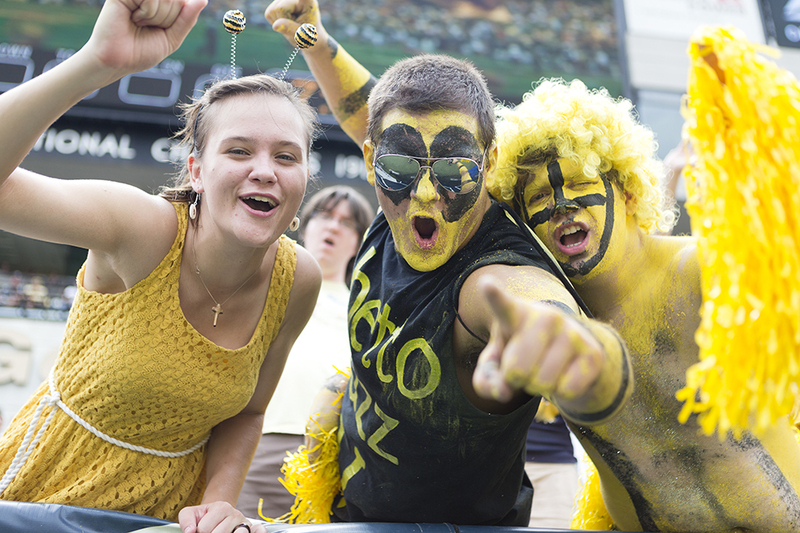 As a third-year BME major, Alex Hubbard forgoes his Tech student identity on game days for a different character: GT Ghettobuzz V.
Technique: How long have you been a Tech fan? Hubbard: In first grade, my parents took me to a GT baseball game. After the game, I got all the players to autograph my hat, including Mark Teixeira. Technique: How long have you been a Goldfella? What was your first game like? Hubbard: I’ve been a Goldfella since the Virginia game my freshman year (2012). I’ve only attended one game unpainted, during which I sat next to the Goldfellas and asked how I could join. One email later, I found myself in the midst of some of the best people I would meet at Georgia Tech. Being front and center at the games, painted yellow and wigged up, was absolutely surreal. I would definitely recommend trying it to any freshman who isn’t sure of what they want to get involved in at Tech. Technique: How do you and the other Goldfellas prepare for a game? Hubbard: A few hours before kickoff, we start slathering our faces and upper bodies with the yellow base layer. After that dries, we paint 4 black stripes on each arm as well as our individual face designs, which are unique to each Goldfella. Near the end of our tailgate, we paint on letters (usually some witty insult to the other team) and douse them with glitter for emphasis. On our march to the stadium, we sing our fight songs, stopping often to pose for pictures. When we get to the bottom of Freshman Hill, I lead the Goldfellas in a few chants (What’s the Good Word!? ), and we take off and sprint to the South Entrance. Technique: Does seeing yourself on TV painted up ever get old? Or is it always exciting? Hubbard: We see ourselves on TV all the time. The cameras love to sweep by us as they’re going to commercial or show an aerial shot of us between plays. In fact, the ACC TV network interviewed us for a segment for the Miami game, and we got to see an awesome video of us on the ACC.com home page. We almost always come away from the games with several great photos of the group as well as individual close-ups. Technique: Why were you chosen as Ghettobuzz? Hubbard: I was appointed to be Ghettobuzz by the previous Ghettobuzz, James Ray, upon his graduation. Technique: Will you be Ghettobuzz after this year? Hubbard: I will be Ghettobuzz until I graduate next year, at which point I will appoint my successor, Ghettobuzz VI, who, if historical trends hold true, will most likely be the person I choose to be my assistant next year. Technique: If you could change one thing about the football team, what would it be? Hubbard: I would bring back Calvin Johnson and Demaryius Thomas.